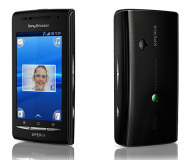 Sony Ericsson XPERIA X8 is going to have a nice piano black version in addition to its white and white-dark blue models. And also, if you already own an X8, you should know that the Android 2.1 Eclair update will be released before the end of the year. A few official pictures of the black XPERIA X8 have leaked recently, but it's just today when we see an actual black X8 in action. The front is matte black, while the back is glossy - think piano black. Here is the video of the black Sony Ericsson XPERIA X8. There is still no official information on the black version of XPERIA X8 from Sony Ericsson, but we think it should arrive for the holiday season. All the XPERIA X8 owners should know that Sony Ericsson promises the Android 2.1 Eclair update to arrive before the end of the year. The front is matte black and the back cover is glossy metallic black. Very nice phone!